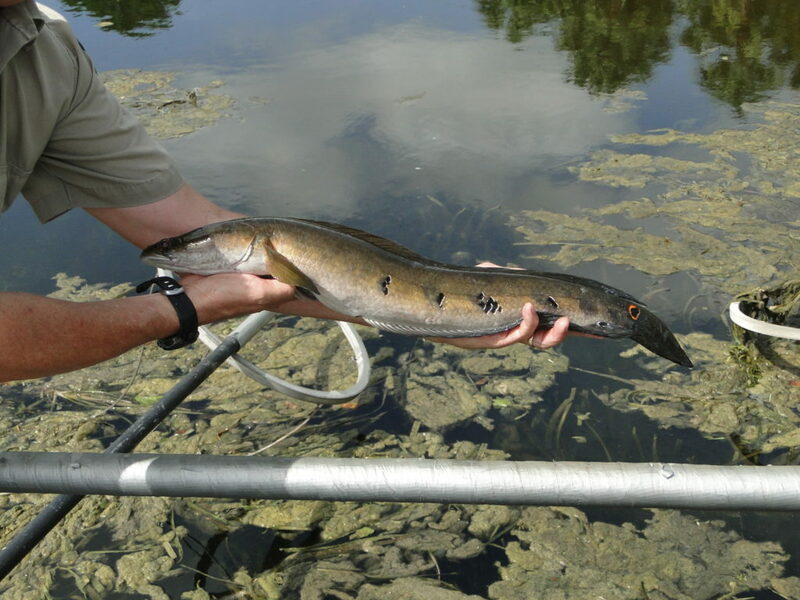 Bullseye Snakehead is a nonnative freshwater fish that was first documented in 2000 in Broward County. These fish are now considered one of more than twenty established exotic freshwater fish species in Florida. FWC promotes the consumption of this nonnative fish. The snakehead’s mild flavor and firm texture make it a chef’s favorite. 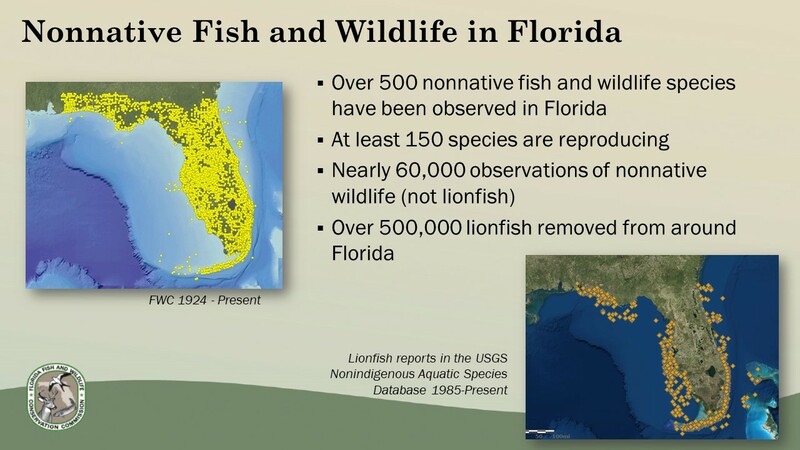 September 27th, 2018 – Florida’s native fish and wildlife are facing a serious threat posed by a variety of invasive species found throughout the state. The Florida Fish and Wildlife Conservation Commission (FWC) is taking steps to combat the introduction and spread of these nonnative animals. Today, the Commission voted to approve a reorganization of rules related to nonnative species. 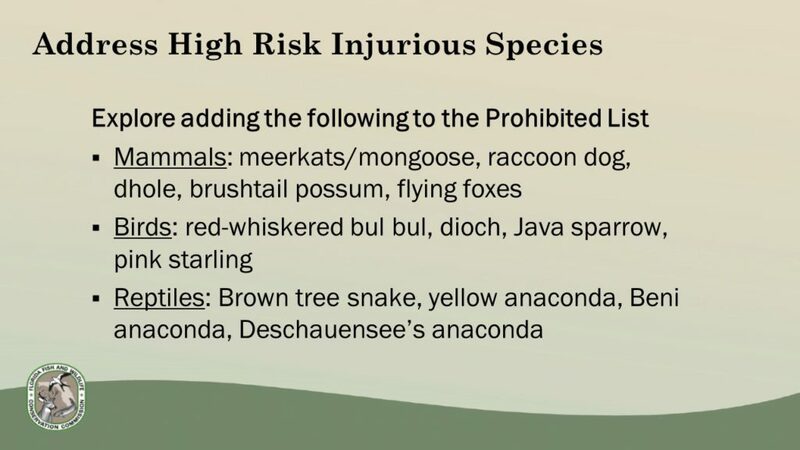 In addition, the Commission requested that FWC Executive Director Eric Sutton and Vice Chairman Robert Spottswood work on a temporary executive order to limit importation of potentially high-risk injurious species. This will act as a stopgap measure while staff develop proposed rules. Status of nonnative species in Florida (from the presentation “Nonnative Species Overview and Proposed Draft Rules”). Invasive species are animals not native to Florida that cause economic or environmental harm or pose a threat to human safety. More than 500 nonnative species have been reported in Florida. 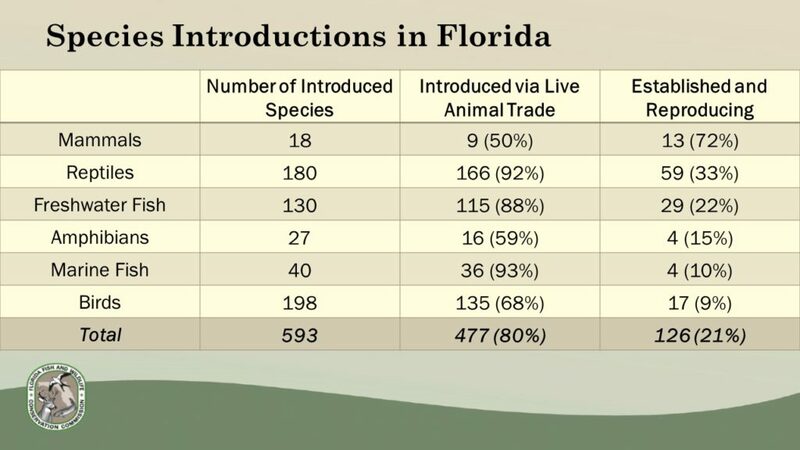 Eighty percent of these have been introduced via the live animal trade, with over 120 established in Florida, meaning they are reproducing in the wild. Sources of nonnative species in Florida (from the presentation “Nonnative Species Overview and Proposed Draft Rules”). We also inquired about the identity of the 4 established and actively reproducing non-native marine species (see graphic above); this number is in reference to the two Lionfish species (P. miles & P. volitans), along with Asian Tiger Prawn, and Orange Cup Coral. “Don’t let it loose! The most important thing that the public can do to stop the spread of nonnative species is to NEVER release nonnative animals into the wild. Be a responsible pet owner. Take the time to learn about an animal before you take one as a pet. In Florida, it is illegal to release nonnative species, including aquarium fish, and doing so can be harmful to native wildlife. Thanks for being a subscriber Mr. Hemmerlein! I’ve emailed you directly at the email you provided with this comment. We should get your concerns squared away pretty quickly. Thanks for being a subscriber Mr. Hemmerlein! I've emailed you directly at the email you provided with this comment. We should get your concerns squared away pretty quickly.